Become a Caribbean Stud poker superstar by practising with the free demo version at one of real online casino site. Table and card games are popular both in brick and mortar and internet casinos. 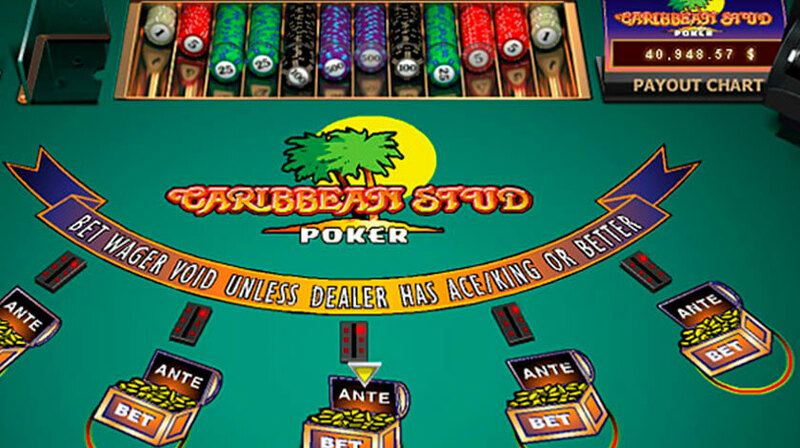 Caribbean Stud poker is one of the latest version of the legendary card game, Poker. What makes this game attractive and unique to players is the fact that it comes with a progressive jackpot, and of course, it is effortless to play. In this guide, we have covered all there is about this new game including how to play for free, the basic rules, and winning strategies. We have also stated some of the reasons why you should play Caribbean Stud game online. As we have already mentioned, Caribbean Stud is the newest Poker version in the market that uses the same rules as the Five Card Poker game. The game is played against the dealer (unlike in the standard game), where the objective is to make the best five card poker hand. The online version comes with stunning graphics and the option to play in full-screen mode. To play Caribbean Stud poker casino game for free, you need first to choose a legit gambling site. Most casino sites offer players with the free version to enable new players to practice, master the rules and strategies before advancing to playing for real money. What’s exciting is that you don’t have to worry about downloading any software since the game is available in instant play mode. Players have a choice to place a side bet on the progressive jackpot (at an extra cost of $1) after placing the Ante bet. Both the dealer and the player are dealt five cards each with the player’s cards facing up. Also, one of the dealer’s cards will face up while the rest face down. The player has the option to fold or call once the cards are dealt. If the player decided to fold, he/she would lose the Ante bet and the progressive jackpot side bet. The dealer will turn over the remaining four cards after calling, and there is a payout where the best poker hand wins. Note that the dealer must have an Ace and a King to qualify. The progressive jackpots put the game on a higher level than any other variants of poker. Caribbean Stud jackpot starts at $10000 and the player strictly bets on the quality of his/her hand. Additionally, the wins are based on a combination of three kind or better, and the game’s paytable determines the payouts. Now that we have known how to play it is essential to understand the basic rules of the game as well. The following rules should be followed when playing Caribbean Stud online casino game. #Rule 1. You are only allowed to play one hand per game. #Rule 2. The dead hand can just be called if the incorrect number of cards are dealt. #Rule 3. A fifth card is dealt with the casino if the dealer gets fur cards. #Rule 4. Players are not allowed to share information regarding the dealt hand. If this happens, a dead hand will be called, and all the bets will be lost. Rule 5. All players must keep their dealt cards in the dealer’s view. You are not allowed to touch the cards after looking at them. #Rule 6. It is the player’s responsibility to ensure that the indicator light is ‘On’ when placing the progressive jackpot side bet. #Rule 7. The must qualify with an Ace-King or higher. Otherwise, the player will automatically win the bet. #Rule 8. The dealer’s ruling is always final. The game of Caribbean Stud poker has with specific odds and payouts. This is why it is essential for players to know the expected return. Although the payouts are simple to master, this variant has a side bet and the main game. Here are the standard odds and payouts of the game of Caribbean Stud. Royal Flush: It is composed of A, K, Q, J, 10 in the same suit and has a payout of 100 to 1. The odds of getting the hand is 0.0001%. Straight Flush: It consists of five cards of the same suit in numerical order and has a payout of 50 to 1. The odds of getting the hand is 0.0008%. Four of a Kind: It is when you are dealt with four cards of the same value. The fifth cards are referred to as the ‘Kicker.’ It has a payout of 20 to 1, and the odds of getting the hand is 0.014%. Full House: It is made up of three cards of the same face value and a pair of different value. The player with the highest three matching cards becomes the winner of the tie. The payout is 7 to 1, and the odds of getting the hand is 0.08%. Flush: Is made up of five random cards with the same suite and has a payout of 5 to 1. The odds of getting the hand is 0.11%. Straight: Consists of five random cards from different suits in numerical order and has a payout of 4 to 1. The odds of getting the hand is 0.22%. Three of a Kind: comprises of, three matching cards of the same level and two extra random side cards. It has a payout of 3 to 1, and the odds of getting the hand is 1.18%. Two Pair: It consists of two sets of matching cards and one unique card. It has a payout of 2 to 1, and the odds of getting the hand is 2.45%. A pair or Less: Consists of two cards of the same level and three random cards and has an even payout of 1 to 1. The odds of getting the hand is 11.76%. Online Caribbean Stud Poker is the best game for players with different budgets, and it does not require prior skills to get started. It is fun to play, and the fact that you can play in trial mode directly in your device’s browser makes it the best choice there is. You can enjoy Caribbean poker free without losing your money and practice.